About: The Golden Lion is a pub that serves a variety of beers, wines and spirits as well as sandwiches and rolls. They also have Sky Sports and a jukebox and can cater for private parties up to 20 guests upon request. From time to time, they also have live music. 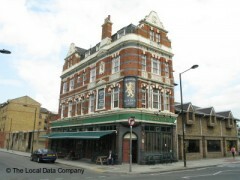 Golly gosh, have just discovered this was my great granddad's pub ........ Will def be visiting soon! His name was Henry Frederick Metz and the family later changed their name to Roberts. How could I rate the pub anything other than 10 out of 10, although I have never been there!